iPass supports a variety of network connectivity types, including Mobile Broadband, Wi-Fi, and Ethernet. These types can be individually enabled in the iPass Portal. iPass serves as a Mobile Broadband (cellular) connection manager. For a complete list of support devices, see the iPass Release Notes for Mac. In order to utilize a Mobile Broadband adapter with iPass, the hardware drivers for the adapter must first be installed on the user’s machine, and the card must be activated. When Open Mobile detects a Mobile Broadband adapter, it will attempt to detect an available wireless signal. Detected networks will appear in the Available Networks list. The end user can then select the Mobile Broadband network from the Available Networks list to connect. Mobile Broadband networks can also be configured for Auto-Connect to Home Networks. iPass displays usage statistics in Connection History. Customers with pricing plans based on usage can quickly determine their accumulated usage. If roaming is enabled (in the iPass Portal), the user will be prompted by a customizable message when they attempt to connect to a roaming network. They can then make or cancel the connection. iPass relies on Mac OS Wi-Fi, and if Wi-Fi has been disabled by the user, or by some other Wi-Fi connection manager, Open Mobile will not be able to function for Wi-Fi connectivity. Open Mobile for Mac does not currently support 802.1x. If you’re travelling, you can easily look up the location of all iPass Wi-Fi hotspots with the iPass Hotspot finder. To access the Hotspot Finder, select iPass Open Mobile > Hotspot Finder. iPass can be used to connect to Wi-Fi hotspots that are part of the iPass network. Using iPass at these locations lets the user bypass the normal sign in and billing associated with that location. If a login attempt to an iPass Hotspot fails, the user can either retry or log in to the hotspot through a non-iPass Hotspot browser login window. Browser log in, by design, bypasses any proxy settings a user might have configured in preferred browser settings. Self-contained browser log in simplifies the user experience, since the user does not need to change proxy settings temporarily to log in, and the browser does not need to rely on a proxy server. 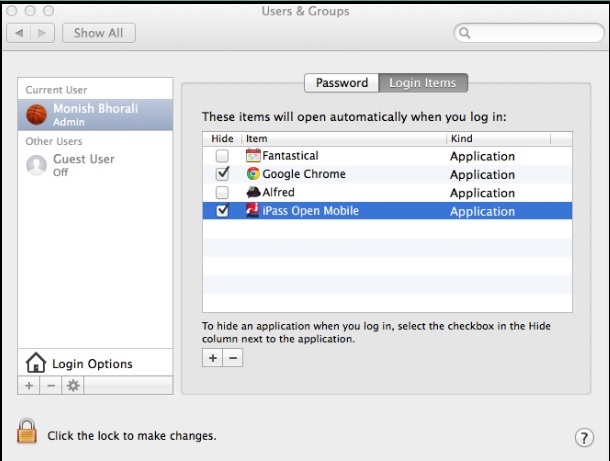 Open Mobile will detect Wi-Fi connections made with other connection managers that utilize Mac OS Wi-Fi capabilities and can inherit such connections, becoming the connection manager of choice. Open Mobile also inherits Ethernet connections. The user can view the status and usage statistics for these sessions and can use Open Mobile to disconnect from them. An inherited connection will be charged like any connection initiated by iPass, and data collected from inherited connections will show up in iPass Insight reports. The first time the user connects to the Internet they will be registered for OpenAccess; however, if they try to connect using an OpenAccess network before they register, the connection will fail (and an error message explaining this will open). The Auto-Connect feature enables users to automatically connect to their preferred wireless networks, either by Mobile Broadband or Wi-Fi. Networks can include Mobile Broadband, personal Wi-Fi, or iPass Wi-Fi network access points. In addition, the user can choose to prefer known Wi-Fi or always select Mobile Broadband for automatic connectivity. Properly configured, Auto-Connect can make connecting to the Internet a ‘zero-click’ experience. If Auto-Connect is enabled, iPass will automatically re-connect to a network when the user is unintentionally disconnected. Auto-reconnect helps automate the connection process if the user temporarily loses signal or loses a connection because of some other factor. When multiple networks are available in the same location, Open Mobile uses a sophisticated algorithm to determine which network to choose for Auto-Connect. This algorithm chooses from the available networks using a combination of connection history, signal strength, user preference, and administrator-defined preferences. Manually disconnecting from a network will automatically turn off Auto-Connect for all networks. Auto-Connect will be turned back on automatically after the user establishes another connection, reboots, or returns from sleep or hibernation mode. To disable iPass from automatically connecting at start-up, deselect the iPass application box from the Users & Groups pop-up. To disable automatic launch of iPass at start-up, deselect the iPass checkbox. You can also deselect the “Open at Login” docking station prompt to disable the automatic launch of iPass at start-up. iPass will inherit any Ethernet connection previously made using another connection manager.